I am excited to join VGo as Vice President of Sales. I learned about VGo just one month ago, and was quickly impressed by this simple and user-friendly voice-bot. 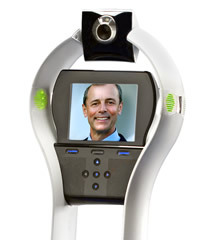 How cool to enable someone to be “beamed” from a computer to a remote location, to see and be seen, hear and be heard, and to move around and interact with people in a very real way, all at the click of a mouse. What a thrill, and what a responsibility for us to find the right fit for VGo in healthcare. Which patients most need continued contact and interaction with doctors and nurses after hospitalization? How can we help busy clinicians who have hundreds of patients to care for? What efficiencies can we find for healthcare administrators who are trying to balance the need to do more with less? How can we assist HMO’s and government leaders who are trying to balance their budgets? VGo is a great productivity tool for professionals in business and research. In healthcare, it facilitates more and better communication between patients and the professionals who provide their health care. I look forward to playing a role in making this solution possible for more people every day.